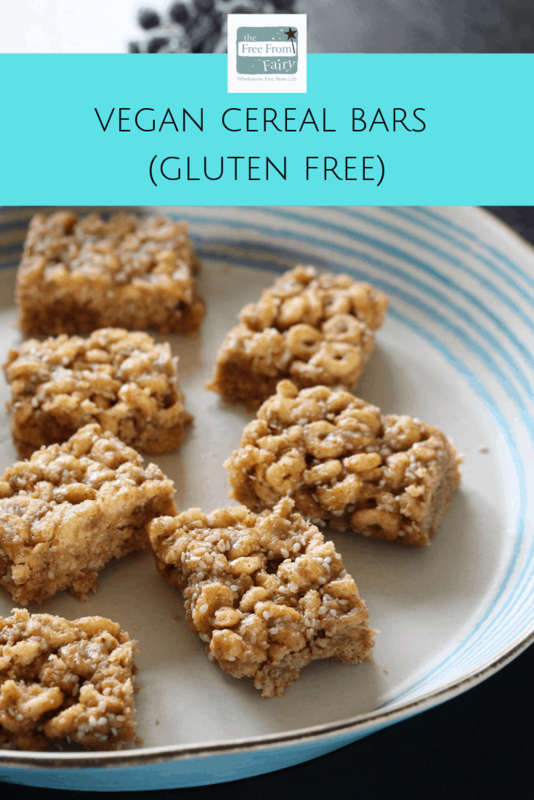 Vegan Cereal Bar Recipe (Gluten Free) | The Free From Fairy. 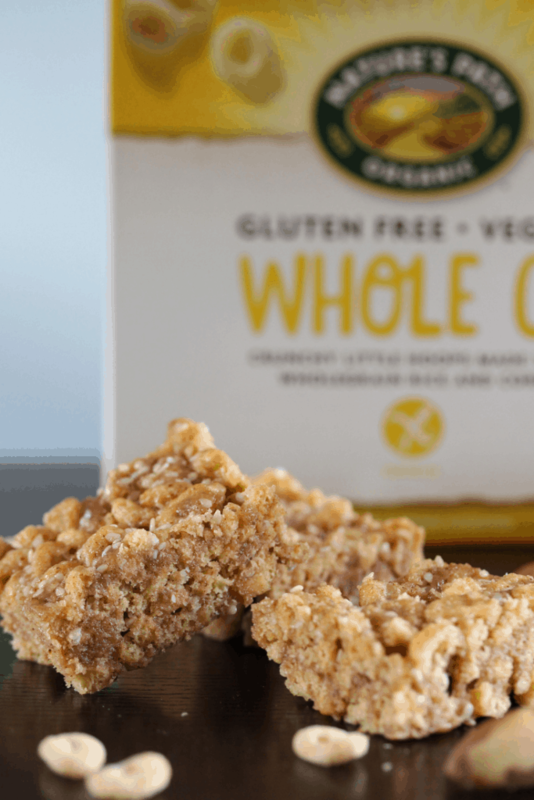 This vegan cereal bar recipe is so simple to make with just five ingredients. It’s perfect for lunchboxes or after a workout. 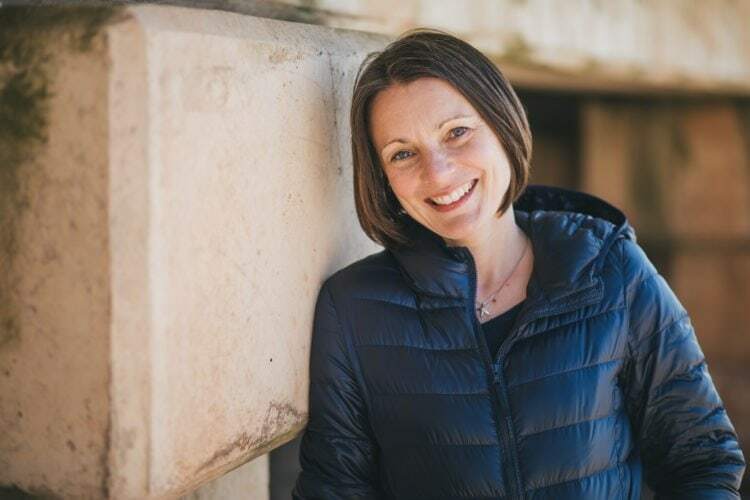 I was paid to create the recipe for Nature’s Path to show how versatile their organic gluten free cereal is. My regular readers will already know that I’m a big fan of Nature’s Path. 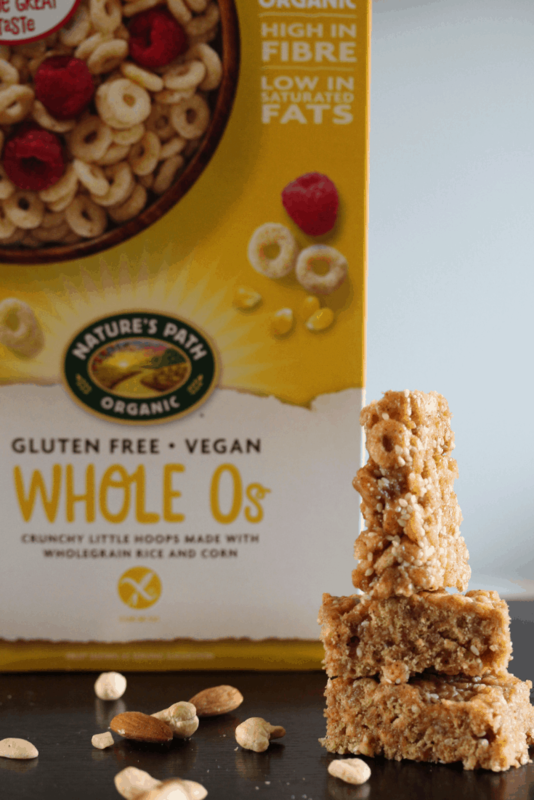 They are a company that produces organic cereal using sustainable farming practices and lots of their cereal is gluten free. In fact when ‘Roo’ was first diagnosed with coeliac disease they were pretty much the only company producing gluten free kids cereals. And when I say ‘kids cereals’ I mean cereals that kids like. The Os get a huge thumbs up from the kids. But they also love the Mesa Sunrise, Maple Sunrise and of course, Crispy Rice. They are all considered treats in this house though, because they all contain rice, which we keep to a minimum due to the issue of arsenic. I was therefore delighted when they approached me and asked if I could create a recipe using their Os. Recently the Os have had a little bit of a make over. Well, the recipe has stayed the same, but the packaging has been changed. In fact the packaging for the other cereals I mentioned have been updated too. Same great cereal. Funkier packs! I have to admit to having a soft spot for the Os. Unlike so many cereals aimed at kids these have very few ingredients and not too much sugar. They are made from brown rice flour, cornflour, raw cane sugar, pomegranate juice extract and sea salt. 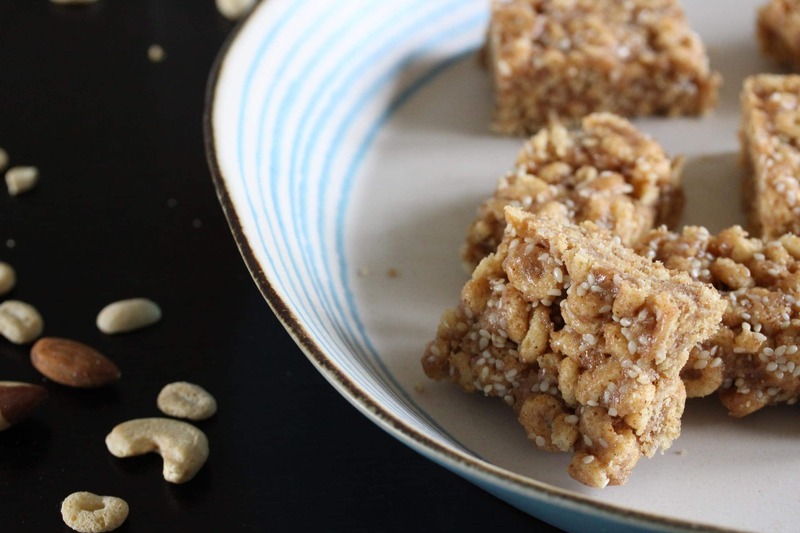 For my vegan cereal bar recipe I decided to bind them together with a mixture of nut butter and rice syrup. I’ve used rice syrup in this recipe because it’s what Sarah Wilson recommended when I was following her I Quit Sugar programme. It is made from fermented cooked rice and is a blend of complex carbohydrates with no fructose. It is thought that it is the fructose in sugar (50% of table sugar) that causes problems for our bodies when eaten in excess. Only the liver processes fructose and therefore if eaten in excess it puts strain on this vital organ. Glucose, on the other hand, can be used by every cell of the body. However, like all sweeteners I urge caution. Anything we eat that is sweet (except for fruit because that contains fibre too) is ultimately not good for us. If you wanted to you could replace the rice syrup with any other liquid sweetener. Maple syrup or coconut syrup if vegan. Both would give the same result but both are still sugars and have their pros and cons. 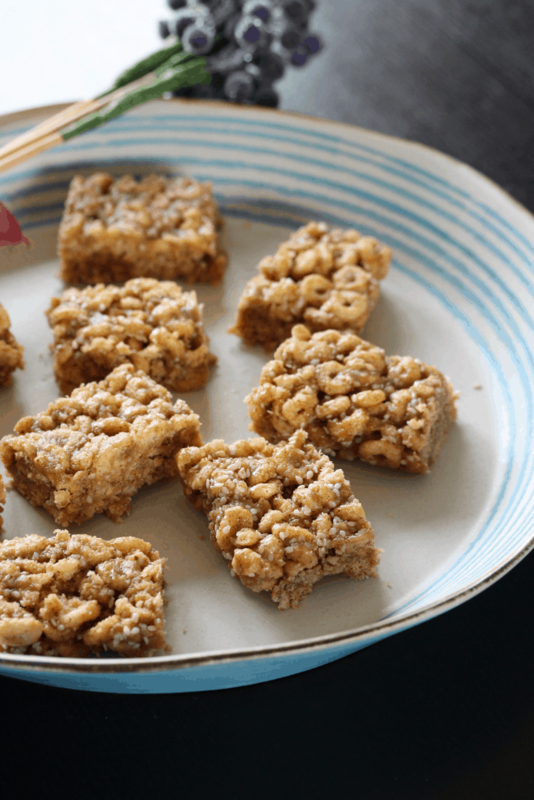 My vegan cereal bar recipe is definitely a treat recipe. It needs a high quantity of syrup to bind the ingredients together so it is sweeter than most recipes I create. Having said that, it is totally delicious and the kids were in heaven. It’s probably lower in sugar than many cereal bars you can buy too. For this recipe I decided to make my own nut butter. It’s so simple to do and tastes delicious. I used a packet of mixed, unsalted raw nuts and pulsed them in my food chopper until they formed a butter. 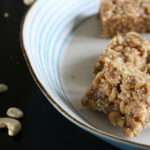 Depending on what nuts you use you may need to add a little vegetable oil to get the runny consistency you need for this recipe. Alternatively you could use shop bought peanut butter, almond butter or cashew butter. In addition to the nut butter I added some sesame seeds. Sesame seeds are a source of calcium which is required in greater quantities for people with coeliac disease. You could either leave these out if you don’t like them or use a different seed that takes you fancy. This recipe is a great base recipe. You can make them to suit you by adding chopped dried fruit, chocolate chips or different seeds. Do let me know what you add. I love to get inspiration from you. 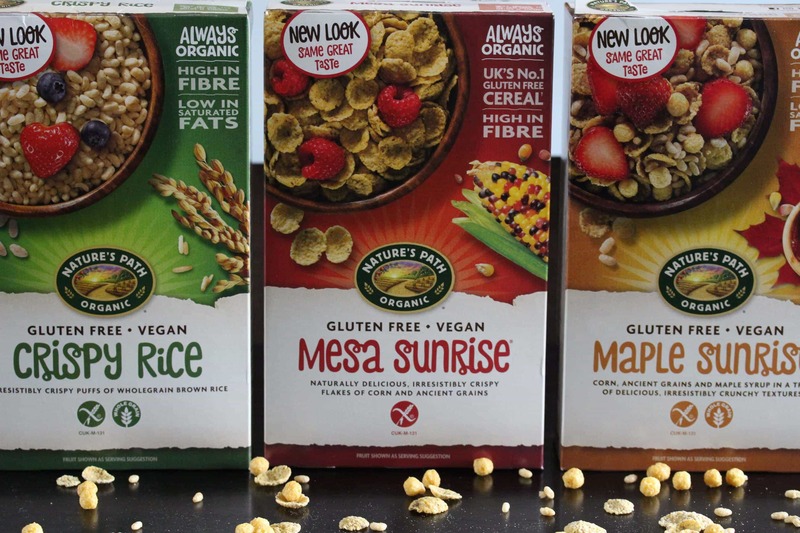 You can buy Nature’s Path cereals in the free from aisle of all major supermarkets. The O’s that I use in this recipe cost £2.99. Nutrition data is for guidance only. « Introducing Simply Skin & A Give Away.